Matt Crafton, driver of the No. 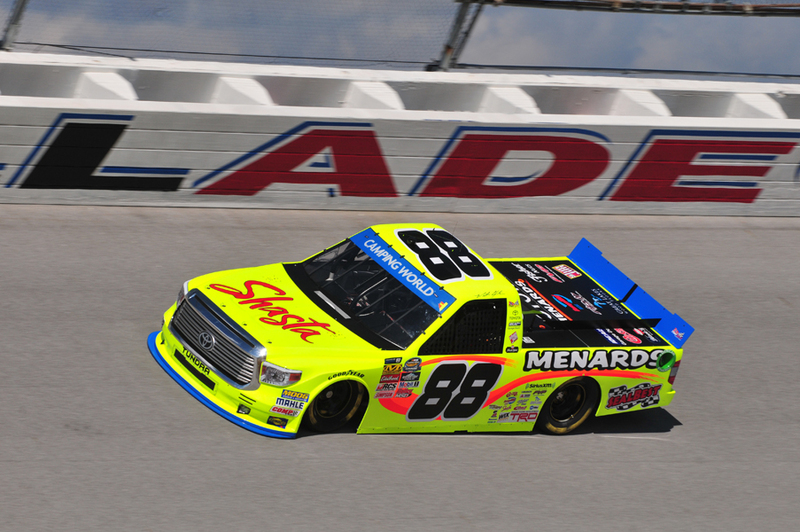 88 Shasta/Menards Toyota Toyota, made his 11th career start at Talladega Superspeedway in Saturday’s NASCAR Camping World Truck Series Fred’s 250. Starting 13th, in the last race in Round 1 of the Chase, Crafton fell to the back of the pack early, and stayed out of trouble. It wasn’t until after the halfway mark in the 94-lap event, that Crafton started to make his way up towards the front of the 32-truck field. Running as high as third, in the closing laps, Crafton was forced to bring his Menards Toyota Tundra to pit road at lap 88 due to an engine part failure. Although the two-time champion was credited with a 22nd-place finish, the ThorSport Racing driver would transfer to Round 2 of the Chase, claiming the sixth and final spot in the standings. How frustrating was it trying to stay clean in today’s race in order to transfer to the next round? What’s your strategy for the next round? The NASCAR Camping World Truck Series (NCWTS) had two practice sessions on Friday afternoon in preparation for Saturday’s Fred’s 250 at Talladega Superspeedway. Matt Crafton was fourth, and eighth, respectively, in both sessions. Making his 11th NCWTS start at Talladega Superspeedway, Crafton started 13th, ran as high as third, and finished 22nd, due to engine problems on lap 88 of 94. In 11 starts at Talladega Superspeedway, Crafton has one top-five and three top-10 finishes. In 19 starts in 2016, Crafton has one pole (Atlanta), two wins, and has led 421 laps en route to six top-five, and 13 top-10 finishes. In 380 career NCWTS starts, Crafton has earned 12 poles, led 2110 laps en route to 13 wins, 95 top-five and 223 top-10 finishes. Crafton’s ThorSport Racing teammates finished fourth (Abreu), 19th (Hayley), and 24th (Rhodes). Up Next: The Texas Roadhouse 200 at Martinsville Speedway on Saturday, October 29 at 1:30pm ET.